Buy Deity garlands and mala online at very affordable prices. Check out our collection of deity garlands, temple garlands, decorative garlands, Hindu god garlands, Pooja garlands, decorative mala, Diwali mala, etc. Shop now! Who doesn’t love flowers, I think there is no one in the world who will not fall for the fragrance of flowers. Be it human or god; essence of flowers enchants everyone. If it comes to puja essentials, flowers and garlands are not to be ignored things. Flowers are very close to gods. When we offer flowers to our deity we pray to spread the essence of flower in our life through his blessing. Whether its normal offerings or special festive occasion; flowers and garlands are mandatory to complete the rituals. In India we worship god with flowers and also make garlands of those flowers to worship god. On Diwali festival we worship goddess Laxmi and lord Ganesha to bring wealth and prosperity in our homes. We use so many puja essentials for worshipping god on this auspicious occasion but before performing any ritual we place flower garlands on the god and goddess’s idol and then start puja. Earlier flower garlands were only use by devotees to enchant their god but now it is also used as decoration in home. People decorate their home and entrance of their house with these flower garlands. It is considered as pious and sacred garland and people place it on the main door or entrance gate to bring positive vibes, peace and happiness in their house. If you too want to bring wealth, prosperity, luck, happiness and peace in your home this year on Diwali then you must buy deity garlands online from our portal. You can use these Deity garlands or mala to adorn and worshiping god along with you can also decorate your home too. The deity garlands are now available in many varieties using original and artificial flowers. The garlands that are made of artificial flowers can be preserved for longer and you can keep it for longer time. We have vast varieties of such deity garlands that you can keep for longer and use while worshipping god at best affordable rates. You can explore our site to choose the best garlands on this Diwali. The Deity garlands section is filled with colorful and mesmerizing garlands that you can also use as Diwali decoration. 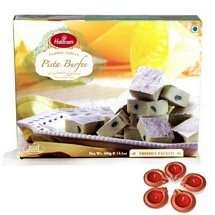 This is also an ideal gift for gifting your dear ones on Diwali occasion. 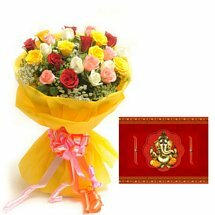 You can buy and send Deity garlands to India online for your near and dear ones as Diwali gifts. 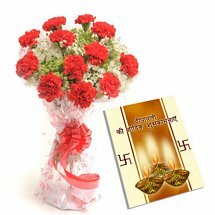 This will bring peace, happiness and prosperity in their life and will be thankful to you for such a pious and auspicious gift on the auspicious occasion of Diwali. A garland is a decorative cord or wreath that is used at festive occasions or religious ceremonies. It is hung around deity idols or frames. Offering garland is a sign of respect. Garlands are always offered to superior powers. In this era of trend and modernity, deity garlands also known as Mala is now been modified to extend. Now garland is not limited to few natural flowers and leafs much more add-ons are now introduced in deity garlands or malas. There is an array of different featured deity garlands in the market. Deity garland with ribbons, deity garland with beads, deity garland with beautiful motifs, deity garland with pearls, deity garland with artificial flowers, deity garlands with satin ribbon are few of the types of deity garlands available in market. In case you want an ease to buy or send deity garlands for your special offerings then you can find them very conveniently at Elite Handicrafts. Here we have the best handpicked designs of deity garlands or mala so that you pick the best for your god. In Indian culture flower garlands are used to worship god, in home and temples god’s statues and idols are adorned with flower garlands. In temples original flowers garlands are used to adorn their deities but it is not always possible to adorn your deity at home with fresh flowers and this also cannot be preserved for longer. So, here you will get attractive and mesmerizing deity garlands made of artificial flowers and leaves. It is the essential of any puja ceremony when we worship god. So, how can you miss the auspicious festival of Diwali? You can buy deity garlands online picking the best one from our elite collection of deity garlands or malas. 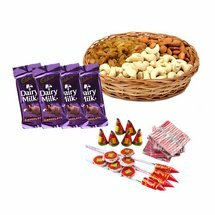 You can also send it to your near and dear ones as Diwali gifts to India online teeming with delectable sweets, chocolate or dryfruits hampers. 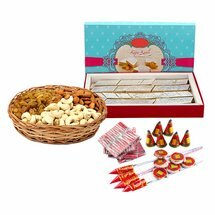 We have mesmerizing Diwali gifts hampers that are perfect to opt for dear ones as Diwali gifts. You can pair the deity garland with gift hampers to make it even more special gift for the person you are sending to. Explore our site to pick the best Diwali gifts and decoration for your loved ones and celebrate Diwali even staying miles away.